Prosupps MyBar™ PRO is a professional version of a popular protein bar. Each portion provides up to 30 g of whole protein, the minimal amount of sugar and a small package of vitamins. The bar is free from gluten and isomaltooligosaccharides. When it comes to composition, the bar leaves its competitors far behind. The product formula may seem similar, however the details are there of great importance. The majority of protein bars is based on plant protein, while the manufacturer of MyBar™ used mainly the isolate and the concentrate of whey protein. They are the main protein source in the presented bar, are characterised by the perfect amino acid profile and have high biological value. Thanks to that we can be sure that protein provided by the bar will be effectively used in the body system and will facilitate muscle mass building and efficient post-workout regeneration. The mysterious isomaltooligosaccharides (IMO) have won popularity in the food market and quickly became a popular additive to food. The manufacturers convince that it is just dietary fibre which is not digested, which is why it does not affect the carbohydrate management of the body system. In fact, there are studies which indicate that IMO are normally digested, absorbed and metabolised in the organism. So it is not true that they are calories-free and do not affect glucose level in blood. Because of such controversy, the manufacturer of MyBar ™ Pro decided to completely resign from IMO. The bar contains natural sugar in such low quantities that is easily balanced with individual demand for carbohydrates. What is more, such low dietary fibre content makes the bar easily digestible and it does not burden the stomach. It is particularly important for physically active people who often eat protein bars as a pre-workout snack. Thanks to that, there is no risk of any digestive discomfort which could decline training quality. The bar is a high-quality snack and a perfect alternative to sweets. It is available in different taste variants which statistically are the most popular among consumers. The presented bar is characterised by the perfect consistency. The consumers pay attention to this aspect and often complain about protein bars being too thick and sticky. 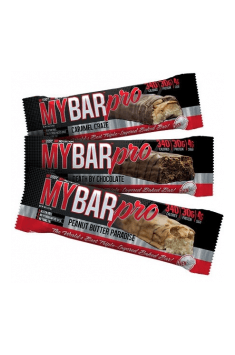 MyBar™ Pro is very tasty, properly soft and its taste resembles a freshly baked cookie. To sum it all up, Prosupps MyBar™ PRO is an exclusive bar of high protein content. It is based on tested components, is free from gluten, IMO and other questionable additives. It will be perfect as a nutritious snack and a source of easily available energy. The bar is based on valuable and nutritious components, which does not mean that it can be consumed without any limits. The portion is quite big (88 g) and is quite caloric. Physically active people can consume up to 3 bars a day. You should eat them with a large amount of water. It is worth to remember that due to its composition, eating a lot of bars at once may result in laxative effects. Protein Blend (Whey Protein Concentrate, Whey Protein Isolate), Vegetable Oils (Palm, Palm Kernel, Soybean), Vegetable Glycerin, Gelatin, Soy Protein Isolate, Polydextrose, Maltitol, Sorbitol, Water, Peanuts, Sugar, Non-Fat Dry Milk, Heavy Cream, Brown Rice Flour, Tapioca Syrup, Cocoa (processed with alkali), Natural Flavors, Salt, Mono and Diglycerides, Sunflower Lecithin, Disodium Phosphate, Baking Soda, Potassium Sorbate, Caramel Color, Whey, Soy Lecithin, Beta-Carotene, Vitamin A Palmitate, Almond and Sucralose.